1. 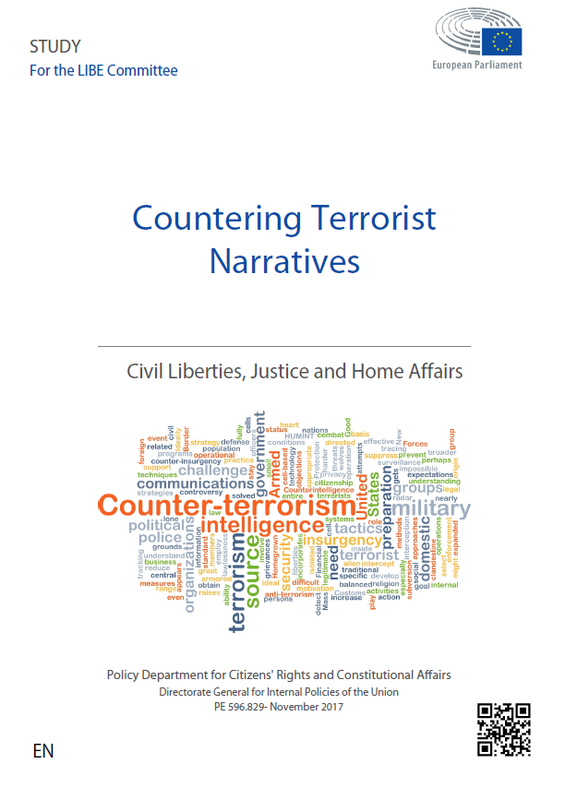 Global initiatives to counter terrorist narratives are carried out by a number of different actors on the supranational, international, regional, national and sub-national levels. The UN has established itself as a key player in the field of counter-narratives, inspiring related institutions, such as the Global Counterterrorism Forum (GCTF) and Hedayah, to assist states in building concrete plans of action in this field. Other international organisations, such as NATO and OSCE, have implemented initiatives that focus on strategic communications and counter-narratives. States have also increased efforts in countering terrorist narratives through cooperation with other states or non-state institutional partners. Finally, tech companies have taken steps to prevent abuse of their platforms by terrorist actors. 2. The EU has assumed a leading role in counter-narrative efforts through its own agencies and programmes as well as through supporting external initiatives. Europol plays a key role in removing illegal terrorist content from the Internet while the EU Internet Forum provides a platform to disrupt terrorist content and amplify counter-narratives. The EU also facilitates a network of front line practitioners, the Radicalisation Awareness Network, which provides analyses of existing counter-narrative efforts. Finally, there are a number of institutes working at the European level, often in partnership with either the EU or Member States, which facilitate the creation of counter-narratives between governments, industry, and civil society. i. Disruption of propaganda distribution – The key objective is to interfere with the distribution of propaganda, in short, to try and stop propaganda at the source by preventing it from reaching its target audience. In particular, this has focussed on taking down propaganda from social media and deleting offending accounts. ii. Redirect method – Rather than erasing propaganda, this approach seeks to redirect viewers to different messages in an attempt to ‘nudge’ their behaviour. Pioneered by Jigsaw and ISD, this project redirects those searching for jihadist material to counter-messaging. iii. Campaign and message design – These projects seek to provide information and skills to Civil Society Organisations (CSOs) to develop communication campaigns, typically based on counter-narrative or alternative-narrative approaches. Whilst disruption seeks to stop the spread of propaganda, this approach seeks to enable CSOs with the skills to confront and undermine the propaganda. iv. Government communications and synchronisation of message and action – There is a tendency for communication campaigns to be designed in a vacuum, disconnected from events in real life. Synchronisation approaches take a comprehensive perspective and aim to link messages and actions, and to coordinate messaging across government and with international partners. The strength of these approaches is to prevent the undermining of a narrative by exposing its ‘say-do-gap’, through ensuring message and actions are aligned, and through limiting contradictory messaging. 4. Although the idea of counter-narratives is widely supported by governments, think tanks and NGOs, the concept itself is rather underdeveloped and lacks a thorough grounding in empirical research. There is little evidence to support the effectiveness of counternarratives and many of its underlying assumptions have been called into question. There is a need for greater research in this area and, in particular, effective monitoring and evaluation of current counter-narrative projects in order to be able to ensure that lessons are learned. i. Disruption of violent extremist material needs to be applied comprehensively and across multiple platforms, in order to avoid displacing terrorist messaging activity between channels. The vacuum created by disruption needs to be filled with a series of messages designed to leverage a range of motivational drivers, in order to resonate with a target audience subject to varying motivations and in order to have a reinforcing cumulative effect on that audience. ii. To ensure coherent messaging over the short, medium and long term, campaign and message design principles need to be synchronised through the establishment of a clear and simple-to-understand, overarching central narrative, which is supported by a thematically diverse array of messages. iii. A clear identification of the target audience is vital to effective strategic communications, taking into account a spectrum of potential consumers of the message (intended, unintended, supporters, adversaries and neutrals). A nuanced behavioural and attitudinal understanding of that audience is needed to persuasively shape attitudes and behaviours. iv. Measuring the efficacy of strategic communications requires assessments that focus on measures of strategic literacy, technical literacy and target audience. These assessments need to be initially performed prior to the commencement of a strategic communications effort in order to establish a baseline measure. Once the baseline metrics are established, these assessments need to be regularly implemented as a means to gauge the effectiveness and efficiency of the campaign over time. v. In order to gain trust, credibility and legitimacy in the eyes of a target audience, messaging needs to be synchronised with activities on the ground, thereby reducing the perceived disparity between what one says and does (the ‘say-do gap’). The central requirement for improving the synchronisation of messaging and action across bureaucracies is largely cultural. Archaic attitudes that ‘actions speak louder than words’ contribute to an organisational culture, often reinforced by doctrine, which affords strategic communications an ex post facto role in operations, strategy and policy. Strategic communications should be a key consideration in planning from the beginning of the operational, strategic and policy design process.